PROBIOTIC GUMMIES FOR WOMEN, MEN & KIDS : BeLive's Probiotic Gummies offer one of the most effective bacteria, Bacillus Coagulans, to improve digestive function, immune system, help promote weight loss and more ... Probiotic that are in food such as yogurt are often killed by our body's stomach which is why we engineered our gummies survive past stomach acids. BEST PROBIOTIC GUMMIES SUPPLEMENT WITH THE HIGHEST STRENGTH: Each serving (2 gummies) contains 5 billion CFU to promote not only the strongest Probiotic Gummies in the market but also provide the most optimal level needed to sustain a healthy long-term digestive health to prevent stomachache, constipation, and inflammatory bowels. 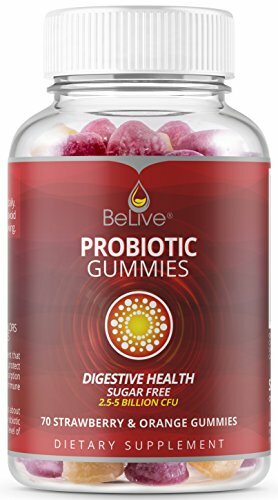 PROBIOTIC & PREBIOTIC VITAMINS GUMMIES COMBO: For best results, take BeLive's Prebiotic Fiber Gummies with Probiotic Gummies. These prebiotic fiber act as the ideal food to feed the probiotics to thrive in our stomach to promote further benefits. Thus, Prebiotic & Probiotic work best when taken together for childrens & adults! SHELF-STABLE, CONVENIENT SIZE, TASTY: No refrigeration needed because our Probiotic is heat-resistant and can be taken anywhere with you. Unlike Pills, Tablets, and Capsules, gummies are delicious and contains no after taste. It is the most painless way to deliver Probiotic into our digestive system for kids & adults. This product Contains NO: gluten, wheat, peanuts, soy, eggs, fish, or GMO. If you have any questions about this product by BeLive, contact us by completing and submitting the form below. If you are looking for a specif part number, please include it with your message.